I have a problem with companies that drape themselves in a veil of healthy. They are almost always doing something truly hypocritical. Whole Foods, for example, serves deep-fried buffalo chicken wings in its buffet section while at the same time advertising kale on its grocery bags. Is the kale on the bag supposed to make us feel better about buying and inhaling the chicken wings? The latest fast food marking campaign that caught my eye is Panera’s. The above photo is of their bakery section. They are the latest company to ban artificial colors, flavors, and preservatives from their food –which I think is very nice. As you can see they haven’t changed the “flip flop cookie” as of yet but they promise to get to it by 2016. Here is their latest advertisement featuring a conversation with Ron (their CEO). He asks us to demand good food from our restaurants so I am now going to do some serious demanding. Bread is one of your main products – why is the Whole Grain bread not 100% whole grain? Does good food include a 1050 calorie Steak and White Cheddar sandwich with 17 grams of fat and 1910 grams of sodium? Why do you insist on drowning your salads in dressing? Can you please get the cashier to ask customers if they want your dressing on the side? Every single one of my concerns with Panera or any of the other companies excited about taking out food additives is that they aren’t cracking the big health issues in American cuisine. The food can be healthier by ADDING ingredients like ensuring the bread is 100% whole grain. Portion sizes are way out of control – look at those cookies and cinnamon buns! They are bigger than my eight year old’s head. Have smaller options for a lower price. Give customers options to reduce the calorie impact of your food. Ask them (not unlike Starbucks) how they want it made. I know that I sound like a crankly old lady and I am sure someone in the comment section is going to tell me to STOP expecting businesses to care about our health. BUT, Ron, CEO of Panera, is saying he wants to have a conversation and want to be part of the solution because Americans are sick. Maybe I am too positive because I have taken the bait. Ron, this is Snack Girl. I believe you should change your food in substantive ways so Americans can be supported in becoming more healthy. Don’t just remove additives and say you are solving the problem. Additives aren’t making people nearly as sick as people eating too many 740 calorie pecan rolls. Do you understand?? On a different note, this year I have been invited to 2 major food companies to give opinions on how to be healthier. This makes me think there is a true discussion happening at this moment in time. Do you have anything to share with Ron? Am I crazy for even engaging in the discussion? Once again you've reminded me of why I love you Snack Girl! I definitely agree with you regarding companies changing small things and then looking for huge kudos. I am in full agreement regarding smaller portion sizes and lower prices. I personally ask for my dressing on the side wherever i go because most restaurants seem to put on at least 2X the amount of a standard serving of salad dressing However, I do think that Panera deserves props for their online menu--the calories are clearly marked as you view each menu item. I know that this is will be required by law shortly, but Panera is one of few companies that i have seen to get ahead of this so far. The calorie information really helps people who are looking at the menus and attempting to make a good choice to have a decent chance at doing so. They definitely have a lot more work to do, but they at least seem to be heading in the right direction. You are so true!! I wish more companies would use whole grain for their bread and pasta. Also, smaller servings and more low fat dressings. However, I visit Panera alot since they are one of the few restaurants that I actually have choices. They have several soups and salads that aren't bad in WW points. I stay away from the bread and sandwiches. I agree. I'm also appalled at the amount of sodium in foods in these places. It really limits my choices at restaurants. I'd appreciate having more low sodium choices in addition to low fat and whole grains. Just went to Panera yesterday and was excited to see some healthy (and gluten-free) soups on the menu. I nearly gagged after the first spoonful. It was so salty I couldn't eat it! I like the fact that you can get an apple with your meal instead of chips. However, almost every time I've asked for that option I still find chips on my plate when I go to pick up the meal. Wow--that was unexpected and awesome. Food additives aren't great, but they aren't as bad as people seem to think they are, and they aren't killing millions the way that obesity is. It's the same mindset that makes a person hop into their car and drive it to the protest about the air pollution from the factory down the street, when pollution from mobile sources--like that car--is responsible for 80% of the air pollution in our country. What's familiar (like a car) is always less scary than what you don't understand (like pollution controls on a factory). Making "additives" the bogeyman stops us from addressing fat and sugar, which are really killing people. you aren't crazy in the least...ironically, I saw this commercial the other day and was thinking about Panera having nerve saying that. I have family members who are lifetime WW that are obsessed with Panera and I always mutter to myself..."Why?" I agree about having a 100% whole grain option, the salad dressing should ALWAYS be served on the side and never served on the salad (by a place claiming they are "healthy"), etc, etc. Consumers should take a stand against false claims and I give you credit for not only doing so, but for hitting the nail on the head! Removing chemical additives is a step in the right direction. President's Choice is doing the same. But yes, good food does not need half its weight to be composed of sugar or salt or fat or any combination of. Good food should be made to taste as it is, good food. What is good food? An apple. A light salad with no dressing, just lettuce and scallions and tomatoes with the lightest dusting of salt and pepper. A steak cooked to perfection and not coated in sauce or salt crusted or slathered in butter. Give me simple food that tastes REAL. We are so roped in to thinking sweet or salty or rich are flavours that we forget how a carrot tastes like straight from the garden. I weep for our taste buds' future, and our waist-lines, if we don't take the right steps soon. 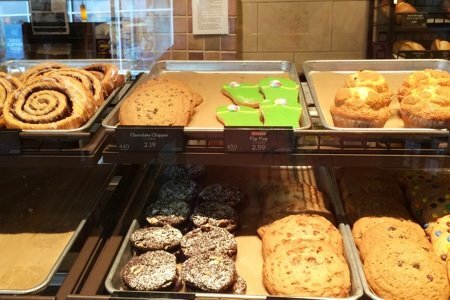 Panera does still need a little work in the healthy dessert options (my kids disagree as they think it's perfect), but I think they are heads and shoulders above so many other quick-serve restaurants. I'd be happy if I could find other places to find a healthy salad and apple (that don't taste like chemicals-looking at you, McDonalds) so that I had more choices when we were on the road and need a quick stop. Snack Girl I agree with you but like others have stated, It isn't the addictives I'm concerned about as much as the sodium, fat,and sugars put into the food. When I say fat I'm also talking about saturated fats and trans fat. Even with changes being made we have a long way to go yet. Wouldn't it be nice to get French fries that were baked instead of fried? I know I would eat them!! Good topic today sanck girl. I agree with you!! Removing "artificial" just gives the appearance of being health conscious. I ordered a fat-free latte at Panera's and requested a sugar-free flavoring and was told that they no longer had any artificial flavorings. I am not sure what they think their sugar-laden flavorings contain but I am quite sure the flavoring is the same. I also found it ironic that they still offered equal packets. I seldom order an entrée at Panera's due to the high sodium in most of their dishes. YES! YES! YES! I don't see a "cranky old lady" here. I see an empowered change-maker. Great post, Snack Girl. I would love smaller bakery items at Panera so I agree with that. I'm glad they removed the artificial ingredients but other changes could be made too (someone above mentioned the salty soups). I'm looking forward to seeing what you write after meeting with the two food companies. Kudos to you once again Lisa! And a comment from the veggie crowd...Hardly ANY vegetarian options! And it's not like I don't ask, EVERY time.. Some soups, but I stay away from restaurant soups due to sodium. Take the chicken out of the salad but still pay for chicken?? REALLY?? Greek salad? It does get boring. And on any salad when you ask for low fat dressing option, they go blank, sometimes ask manager, sometimes check on their phones. And anything real whole grain would be welcome. Finally, please DON'T call them fast food. There is usually a long wait even when you order in advance, the cost is much higher than fast food, yet you are expected to clean off your table??? Not me, not my guests either! I am over Panera. I agree with you to the extent that removing additives isn't really getting to the heart of the problem. However, people can choose what they eat/order. You can ask for modifications (assuming they exist - and many do) and I think people need to generally take more responsibility for their own health. I don't think it's fair to put that on employees by having them ask if you want your food prepared in a healthier way or (fully) on companies, who exist to give consumers what they want. Slowly, healthier options and modifications are appearing because that is what consumers want. That said, sometimes you want fries or a giant cinnamon roll and I think that's okay. You go Snack Girl! I see the same advertisements and realize how hypocritical these companies truly are. They think we will all hear their messages and go away with a feel-good attitude about their products. I see the calories when I walk into a Panera and try to pick items that are low fat, such as a salad with dressing on the side and perhaps half the cheese added, that sort of thing. I like COSI better than Panera, they have bigger salad portions (more of the green stuff in there where Panera gives you a big bowl with very little in there!) Speak for all of us Snack Girl - we are behind you 100%. I must have a really GOOD Panera Eva K. Even a half of salad at our Panera is filled to the top with lettuce and extras. I was never a fan of COSI. We all NEED an advocate like you to lead REAL change for healthier choices. If companies want to advertise "healthy" it shouldn't just be lip service. You aren't being a crazy lady. Thank you from many of us for rattling cages. do --- lost my respect for them. I fully agree! I have been saying for years that I can't wait until I qualify for the senior menu where portions are reasonable, and fruit is a staple (as opposed to chips / fries). I love Panera's bowls and salads. I agree - don't add the bread, put the dressing on the side by default, decrease calories. It really won't detract from the appeal of the food! I'm in the minority but I have no problem with Panera. Also of course the bakery items are calorie bombs, they are bakery items! Calorie counts are there so I just don't see why everyone is upset. It is ultimately my choice when I eat. It's not Panera, McDonalds or any other places responsible for my healthy or unhealthy choice. If I eat 10 of these high calorie muffins, I have to deal with the consequence. It's just that simple. People have to take responsibility for their own health. I agree!!! If you tell me it's "whole" grain then it should be whole grain! And I would love a smaller cookie and other sweets, at a smaller price. It fits my income and satisfies my sweet tooth without over doing it. If I buy big I eat big. Panera or any fast food restaurant should be considered a treat. To eat truly "clean food" it needs to be made at home where you know every ingredient that goes into what is prepared. We get Panera once in awhile in a pinch. My main gripe is that almost everything has dairy and tons of sugar-- so if you're trying to avoid those things- it is very difficult. I do agree with you Snack Girl-- people could think, "wow, they said it's clean so it must be good for me" when it's still super sugary and high calorie. I wanted to get a plain iced green tea and discovered that it was sweetened (Large= 55g sugar!) -- why do they have to mess that up? Green tea is perfect on it's own! The Green Smoothie has 47g sugar--it's mainly fruit and the only thing that makes it green (spinach) is the last ingredient. Sheesh! That is NOT a green smoothie. :( Those are things that could totally be made healthy but definitely aren't. The antibiotic free chicken is fine, but it's still not organic, so...not quite there with that. Thanks for asking hard questions and getting the conversation started. Keep up the fight! I agree completely- Ron, you can make a positive difference by reworking your menus to provide truly healthy lower calorie foods in sensible portion sizes. If you fail to grasp this challenge you remain"part of the problem". Well, Panera needs to do something about their salad lettuce - it's completely awful bag gross lettuce and I refuse to eat their salads. On the flip side, I think their broth bowls are quite good. A company should offer good food, but it's ultimately up to the customer to decided what's good for him/her. I believe removing additives and chemicals in our foods is a first step. They are chemicals wich can change our chemical make up and lead to addiction. How many people do you think are addicted to sugar and why? These companies are out to make money so they are not going to sell what most of the population wants. The only way to fix obesiety is not by blaming others but with starting to take responsibility for the choices you make. Pamela or any other company is not forcing you to eat their food. They do give you healthier choices but are you making them. We have to re- educate people on good nutrition. Snack girl you do a great job at exposing the "advertising tricks" that companies use to get people to believe that they are making healthy choices. It still comes down to being responsible for your choices. Eat more natural foods and stay away from the processed foods cook you meals and eat out less. I am canadian and we do not have quite the same problem as the US but we are biting at yoyo heels.....we have panera here too. just give us a normal portion...not a serving for three! I agree that we should ask for and receive minor alterations in our orders at ALL eating establishments. With extra attention and KNOWLEGE of proportions to taste FOR A DELICIOUS ORDER, will establishments pay more than minimum wage for kitchen staff? If the dressing is too much for you, why not just ask for it on the side? The bakery items might be a little large but there's no one forcing us to eat the whole thing at once....save some for later. These items should be considered a treat and not consumed on a regular basis. I believe it's all about personal responsibility for our own health. Panera is trying to make things a little healthier...I give them credit for that. I completely agree with Ellen when she said "people can choose what they eat/order." I don't think it's the restaurant's or employees' fault if we don't choose wisely. If a place doesn't have choices that fit in with what I choose to eat, then I don't choose to eat there. Let's be careful about placing blame! I seem to be in the minority on Panera. I've been ordering my dressing on the side for over 30 years and its never been a problem anywhere. I like Panera for its many great options, their half sandwiches, several of their soups [black and chicken], and salads. I think the apple is a great sub for chips. It is a planned lunch for me, about 4 times/year because its right near my favorite clothes shops. When I walk in I don't feel nauseated from the stench of fried food and cheap cheese. I don't consider Panera "fast food" but rather a chain food. As much as I prefer organic whole grain everything, Panera's whole-grain option is better than any restaurant offering that I know of. Does Subway? I don't go there so I could be wrong here. Panera has always been very accommodating on modifications too. Don't you think health-conscious people who can navigate fast-food places, as is shown on this site, can find more palatable and healthy meals at Panera? And ''yay'' to any improvements they made and plan to make due to consumer activists and trends toward more quality food in general. I eat at Panera from time to time and like it as an option as you can get good salads there or 1/2 sandwich and salad or similar. Much healthier than most restaurants in my area (lots of Chinese & Mexican food, burger joints, etc). The local Panera salads are pretty generous and don't have bad lettuce as was mentioned, perhaps because I live in California so we get it more quickly? I agree on the insane sodium in EVERY restaurant. I have seen crazy things with high sodium...Chili's menu is the worst for that! I understand flavor is important but they could cut the sodium in half and it would start to approach normal home cooking. I don't have a medical reason to reduce it...it just tastes terrible to me. I would also love a small dessert option. There are some restaurants in our area with the little shot glass layered desserts that are 100-200 calories and they're a great option...a little sweet treat but not calorie bombs. It takes a lot of willpower at Panera to pass the giant bakery case and order your salad and then decline when they offer you the "extra bakery item for just 99 cents". It helps that calorie counts on chain menus are state law so seeing all those 500, 600 calories listed next to each of the desserts in the bakery case helps me resist. I think you are a wonderful advocate for healthy food standards. I do think if we are to be responsible for what we put in our mouth, it should be up to us to ask the question (before we order), if dressing comes already on the salad. As Americans, I think we want everything spoon fed and catered to our every whim. We expect someone to tell us, instead of taking the initiative to ask. If we are really and truly concerned about our health and what we put in our mouth, look up the nutritionals on what you want to eat before showing up. First of all, great take on Panera. Their calorie counts are through the roof on most items and their ingredient list isn't impressive. My favorite Panera quote was the person who ladled out the wrong soup and when I questioned her told me that it wasn't her fault that all of their soups looked the same. It's really frustrating to hear people saying that they had a healthy lunch because they went to Panera and had a salad. I guess I'm more of a skeptic than you are though. I wish I could believe that companies were really planning on making their food healthier as opposed to merely publicly stating the fact and co-opting bloggers and consumers. Oh, and regarding Whole Foods, I'd rather have a grocery store that serves chicken wings but also offers healthy takeout options than the stores with pizza, bad Chinese food and subs. At least I'd have a choice. I don't pay attention to commercials so I knew nothing about their removal of additives and artificial stuff, etc. I don't even eat at Panera. I do agree Americans need to take a stand and have better choices, but I also feel we all need to be responsible for our own choices in life. Ask for your dressing on the side. Share your meal with someone or take home leftover for another meal. No one says you have to eat everything on you plate. If you get the big pecan roll cut it in half and take the rest home. We all need to take responsibility for ourselves along with being advocates for change. I agree with you Catherine Beaudet !!! ... Real food IS good food, simple... We humans were made to eat it in the most natural state, not overly processed ... Yes, I like Panera's and cheering them on for the changes already made, and in the future better choices too.... Any company that is truly TRYING gets a positive vote! I'm all for healthy choices, which I think Panera is offering more than most. They are ultimately a business trying to turn a profit to feed their families like anyone else. It's always your choice what you CHOOSE to put in your mouth or buy for your kids. I just don't think Panera should be held responsible for baking a huge cookie if we are the one's who decide to eat it... Last I checked they're not forcing anyone's hand or cramming it down anyone's throat! And I'm sure there are good and bad individual establishments... The Panera I use will definitely put the dressing on the side if I open my mouth and ask... They certainly can't read my mind. We only eat at Panera infrequently because you can get an entire day's sodium in one meal - even if you ask to have the dressing put on the side. We agree that no bread they offer is great. Once you have eaten a good whole grain bread, it is difficult to go back to the other kinds. Also, we have told them many times we would like to see smaller cookie offered. I always tell them I don't plan to buy any dessert that would require me to power walk on my treadmill for over an hour to burn off the calories. It's obvious that the comments their guests make are not getting back to the people who need to hear them. As for "don't buy it if you don't like the calorie count," we don't but I'm willing to be that many people don't have the will power we do. It's not not to tease, either. I do love that Panera has put the calorie count on everything because now I don't have to tell my husband that the food he usually chooses are not the healthiest choices. He can read it for himself! OH, leave Panera alone! At least they are trying and improving. Not like you have to eat those items if you don't want to and they do post those items so we can make up our own mines. Don't sell us, the consumer, short---we are intelligent to make up our own minds. Most things you say I like but like everyone else, you have jumped on the bandwagon of dishing a company. I personally like Panera and go there often. It is near our excercise class so we go there once in a while after class. I love the greek salad and they have a few other vegetarian options (soup and veggie sandwich) which I appreciate. Are the bakery goods tempting? Of course but if I do get a treat I take it home for the kids to split and just have a taste. Moderation is key! I'm a big fan of Panera's Poppyseed Dressing, which is "fat free, low sodium" and has only 15 calories per tablespoon. It's sold with the refrigerated dressings at Target and Ralph's (Kroger). In your opinion, is this a good product? Way to go! Please keep this up. Having a "no-no" list is insulting to people and encourages their faux-healthy image they have. It's just unfair! I love that: "Additives aren’t making people nearly as sick as people eating too many 740 calorie pecan rolls." Panera's cookies look like small pies! I never order any of their baked goods, because I know myself - and I would eat the whole 450-calorie cookie in one sitting. If the goodies were smaller, I would actually buy one once in a while. Maybe the idea is that people will flock to their stores to buy the super-sized desserts, guilt-free, because they could later tell their friends, "I was good today. I only ate one (629 calorie) cinnamon roll :)." Panera. If i hear them refer to food as "clean" again I will call for a nationwide boycott of that dump. So anything I eat all day other than their slop is "dirty"
Talk about a pompous way to advertise over priced, bland boring food. You are an amazing advocate for healthy food and so spot on in criticizing these Healthy Food Hypocrites. And you have the credentials to back up your comments. If a company is going public with healthy claims which are not entirely true, they need to be called out on it. Also a company has the responsibility to train its front line workers. The cashiers are not aware of any low fat dressings, never ask if dressing should be on side, or even how you would like your order. The line staff routinely make mistakes with orders. A bit more honesty and please MORE TRAINING of staff. I find the Panera ads talking about clean salads obnoxious. The salads may be adequate but the word clean is offensive. It's a salad! What do they think is in a salad, roach filled hamburger? Hi Lynne, I can only speak for the Panera Bread restaurants in Northern California. There is not one dessert in our restaurants that is under 300 calories. Every time I qualify for a "free dessert of my choice" via my rewards program, I also ask and they smile and say they have nothing. As for reducing sodium, if they cooked the chicken with too much sodium, there is no way to reduce it. I already put the dressing on the side and ask for no cheese. I cannot think of one menu item they serve (other than desserts) that would freeze well. So, while you offer great ideas and make valid points, they don't work well in this restaurant. Additionally, I think restaurants would have MORE business if they didn't copy everyone else and offered something for the many people now trying to be healthier as Michelle Obama is trying to encourage us to do. I think it would be just like the "no smoking" in bars issue. The bar owners said they would lose business but, in fact, they gained because all of the non-smokers suddenly were willing to patronize their businesses. Forget about getting gluten free items at Panera. They say a salad or chili is gluten free but it is not. There are ingredients in them which are not gluten free! Also there is lots of corn, soy, canola, and cottonseed oils in most of the food. And lots of "gums" which are also bad for gut health. Sugar or corn syrup in just about everything. All the soups and chilis come frozen in plastic bags and are thawed out in steaming hot water. I'm glad I know all this now and will not be eating there again. Why are customers always putting the absolute onus on everybody else but themselves? A customer is free to impart on those waiting on them or taking their order to instruct how they want their sandwiches. They'll gladly eliminate anything and will give you dressing on the side etc. I have never been to any eatery or restaurant if you prefer, that told me no. The main complaint I have will all of them is that there is no healthy choice other than plain salads. It's hard if one is on a low sodium and or sugar diet either by choice or for health sake. Take responsibility for your own indulgences and most of all, presently,this is still the land of the free and hopefully Trump will not get a chance to change that although he's making a concerted effort to do so. He'd be broke if not for the freedom of bankruptcy which is his cash cow.